Each Sunday, Bob Gaughan recaps and reviews the college football weekend. Last year Clemson was able to recover from a home loss to Pittsburgh to win the national championship. This year it remains to be seen if they can overcome the loss at Syracuse 27-24 on Friday. QB Kelly Bryant played but wasn’t 100 percent. He left with a concussion just before halftime and the Clemson offense didn’t look the same in the second half. Give Syracuse credit and coach Dino Babers. Babers did an incredible job of exposing the Clemson secondary. The Clemson defensive line dominated as usual (four sacks alone in the first quarter). 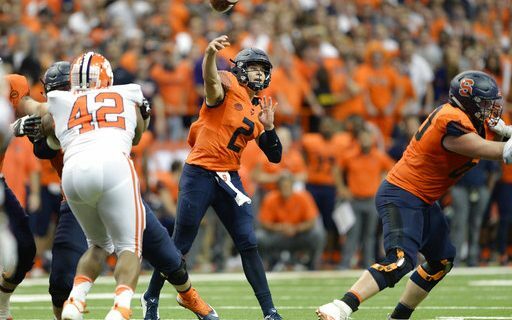 However, Babers is a genius in the passing game and QB Eric Dungey threw for 278 yards and three touchdowns. Clemson needs to regroup because they still have four tough games on the schedule: Georgia Tech, NC State, Florida State and South Carolina. Bigger issue other than health at QB that Clemson needs to address is field goal kicking. They missed to field goals inside 40 yards. Washington State was waxed in California against the Bears 37-3. Luke Falk was awful. Falk only threw two interceptions in his first 262 passes coming into the game. He threw five interceptions Friday night. He threw an interception on his first pass, threw an interception in the end zone, and he had a fumble returned for a touchdown, OUCH! It was a bad night overall for a QB prospect that was moving up the ranks. The Cougars didn’t show up to play, they had seven turnovers and a one yard punt, yes a one yard punt. Bigger issue the Cougars need to address is a bad offensive line that had Falk under pressure all night. LSU rallied from a 20-point deficit to upset number 10 Auburn. The Tigers seemed dead after dropping back-to-back losses to Mississippi State and Troy. LSU has now rallied to upset Florida and Auburn. This was a microcosm of their season. Auburn led 20-0 in the first half before LSU mounted their biggest comeback since 1949. LSU was still down 23-14 heading into the fourth quarter when DJ Chark took a punt return back 75 yards for a touchdown. The LSU defense really stepped up in the second half in shutting down the Auburn offense. Auburn had only 73 yards on 32 plays in the second half. Sam Darnold came back from a horrible first half to lead the USC Trojans to a 28-27 win over big underdog Utah. Darnold was awful in the first half, he had multiple fumbles and a near interception. The Trojans were down 21-7 at the break. Darnold then showed why people love him. When it mattered most he showed the ability to make big plays. He finished with 358 yards and three touchdowns. Utah could of tied the score in the final minute, but instead decided to go for a two-point conversion and the win. USC’s defense came up big in stopping the play and preserved the win. *Lamar Jackson had over 500 yards off offense but it wasn’t enough as Louisville was upset by Boston College. *Will Grier and David Sills hooked up for three scores in West Virginia’s 46-35 win over number 24 Texas Tech. *Mason Rudolph threw for 459 yards in Oklahoma State’s romp over Baylor. UB dropped a close 14-13 decision to one of the MAC’s best teams Northern Illinois. Drew Anderson coming off his record performance against Western Michigan left the game in the second quarter with a shoulder injury. Unless Tyree Jackson recovers from his injury the Bulls are down to their third string QB Kyle Vantrease. Vantrease almost led the Bulls to victory, but Adam Mitcheson missed a 34-yard field goal in the fourth quarter that would have given the Bulls the lead. UB fell to 3-4 on the season. The one positive note is the schedule gets easier from here on out. Next week the Bulls travel to play a Miami-Ohio team that is 2-5 and has dropped three straight games.